Info: cloud-client.info App has been removed from the Windows Store. i’ve removed the cloud-client.info App from the Windows Store, if you have already installed the App you can use it for an unlimited time but there will be no future updates. Thank you to all people using the app and sorry that i don’t have the resources available to keep the app running. you can now pick up the last Version of our App from the Windows Store. No Ads, No in app sales of course. – Fully removed Universal Desktop CE from the UMS Template (last IGEL Windows CE based product goes end of maintenance on 31.03.2014), Profiles are still available as Import file in the “Template via Import” folder but will not be part of the template anymore. – Changed “Template via Import” subfolder structure, import is now based on OS Version (Linux, Windows ES or CE). a new Version of the Deployment Assistant Tool for IGEL Thin Clients Version 1.07 is available for download. 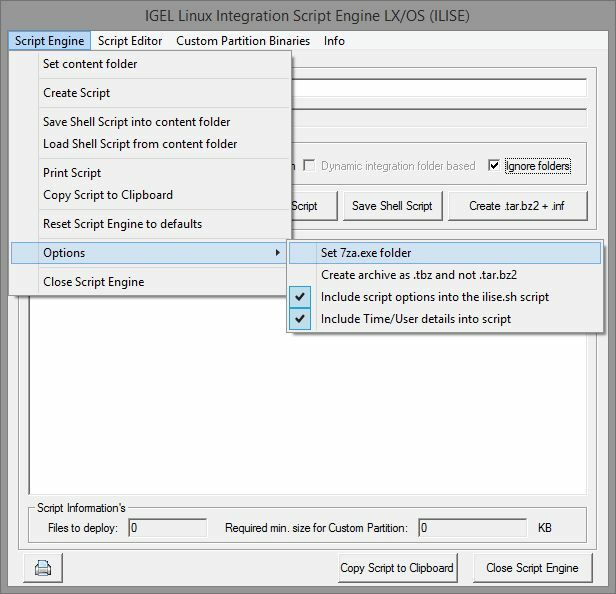 Added ILISE option to prevent the creation or link of any folders, only files will included into the existing folders in the IGEL Linux file system. 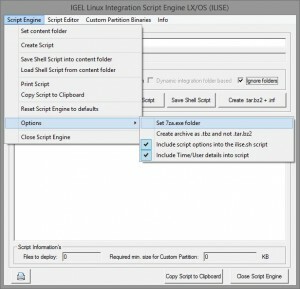 Added ILISE option to save/load the script generator options into/from the ilise.sh script. Added ILISE option to add creation/user informations to the ilise.sh script. Optimized DATI update check, DATI will check now if a internet connection is available before the update check runs. Reworked ILISE Script Option handling (unset/disable not required/possible option). here is the final Version 1.06, i fixed some issues and also some new features are available. It’s not recommended to use any of the 1.05 Version anymore, iam sorry that i did not note all issues during testing and thanks for your comments pointing out some “issues” and help fixing it. Important: Please delete the dati.ini after update! Added Option to configure automatic Update check for DATI during the application starts. ILISE added Linux Library clean up, see in this ReadMe.txt for more information’s. ILISE “Create .tar.bz2” button will now also create the .inf file in one step, you still have seperate options for archive/.inf files in the ILISE Menu if required. Fixed issue with the “Show Warnings” Option, the setting was ignored sometimes. Fixed ILISE issue that protects an automatic generated script to be overwritten by the generator if no MyScript Area exists. Fixed ILISE issue that a .tar.bz2/.tbz archive was created successfull message shows up but the file wasn’t created. Fixed ILISE issue if a folder contains one or more subfolders and some files are not identified/added correctly to the script. Fixed ILISE .tar.bz2 / .tbz switch. i just uploaded a quick hotfix for the DATI with the following changes, it’s strongly recommended to use the new version. Thanks for your feedback! Fixed ILISE issue if a folder contains subfolder and folder and some files are not identified/added correctly to the script. 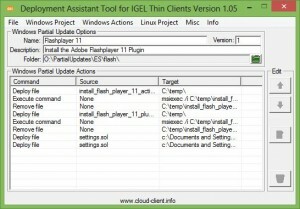 here is a new release for the Deployment Assistant Tool for IGEL Thin Client Version 1.05. ILISE has now a drop down menu that contains several features/options. 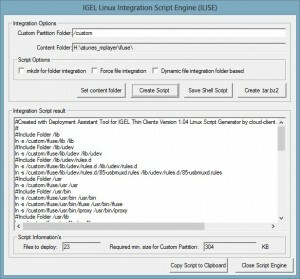 ILISE allows to edit the generated integration shell script now. ILISE can now add a protected MyScript Area for your own extensions, this area will not be overwritten by the script engine. ILISE can now load already created shell scripts (ilise.sh) if available in the content folder for the custom partition package. 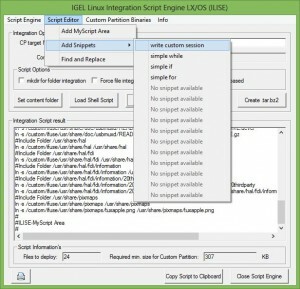 ILISE now supports up to 15 custom code snipplets to be added to the ILISE MyScript Area. Added find and replace function to ILISE, find and replace will modify all lines generated by ILISE and the MyScript Area by default. Added “Reset Settings Option” to ILISE. Fixed a small display issue with the ILISE Tooltip’s. Added Cloud-Client.info Website URL’s to Info Menu. 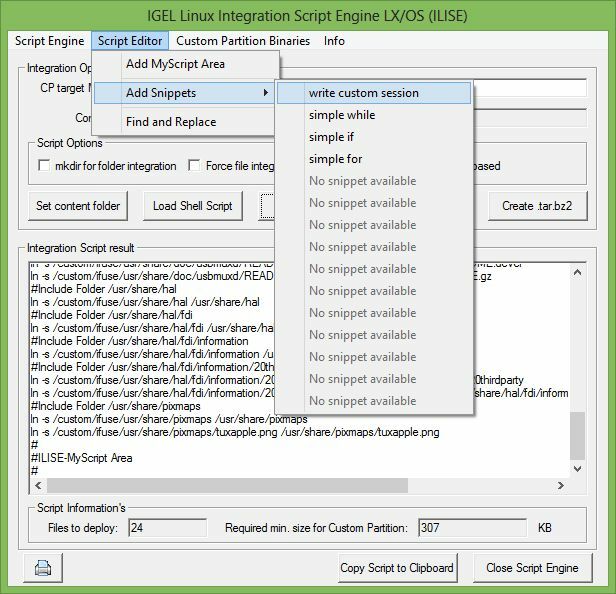 Updated URL to IGEL’s LUNA Script Language Manual for Windows Embedded Partial Updates, URL can be modified in the dati.ini if changed again. Added Cloud-Client.info Whitepaper related to Linux custom partition basics as Helpfile (optional download). New Feature: Help Download Tool, DATI will now offer the download and include of missing Helpfiles / Whitepapers. ILISE can now create .tar.bz2 or .tbz files (configured thru ILISE options), .tbz format/extension is used by IGEL Technology. ILISE will now check that 7za.exe is available in the configured/default folder before creating a .tar.bz2/.tbz archive. Custom Partition Package .inf file creator can now select .tar.bz2 and .tbz files to create the required .inf file. Added Print Script feature to ILISE for the purpose of documentation, this will print the generated script incl. the MyScript Area. Added DATI .ini file, the .ini file will be created if not exists and contains configuration settings for DATI. Optimized code and graphics, dati.exe size reduced from 364KB to less then 220KB without loosing any features. P.S. : There is Version 1.05.1 available fixing an issue with the .tbz/.tar.bz2 switch in the options, thanks for the report! 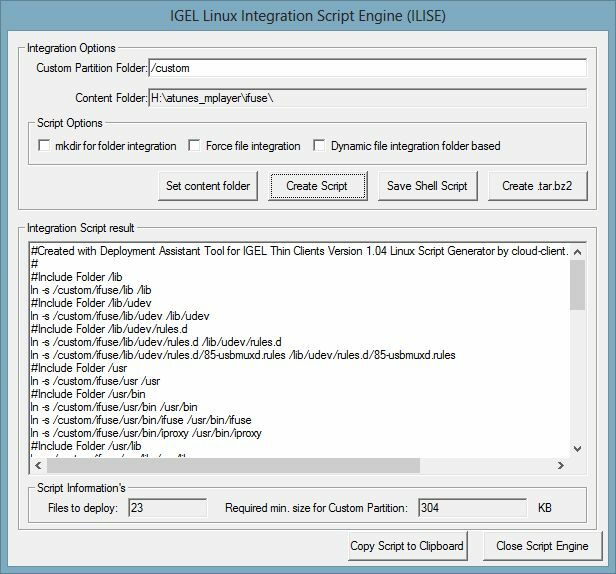 ILISE can now also write the Linux integration script as Linux executable shell script (ilise.sh) in the custom partition content folder. Fixed issue with the Partial Update->Deploy several files from one folder function (always one file was not copied). Fixed issue for ILISE if the content folder has no subdirectorys to prevent a not valid // script entry. ILISE can now create a .tar.bz2 archive based on the set content folder for the custom partition. Added some options to the ILISE script engine. Added helper folder for add-on tools (currently 7-Zip command line tool is added to create the .tar.bz2 file). Optimized ILISE Engine to provide a better user experience incl. a status Windows and User messages/warnings. Added Tooltip’s to all features in ILISE. 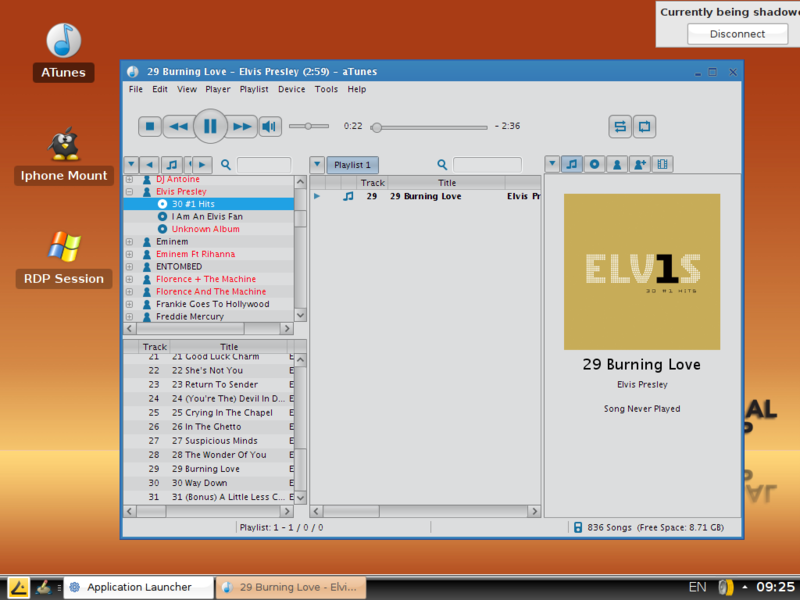 Updated cloud-client.info logo for the info window. here is a new Version of DATI, Version 1.03 comes with an Beta Version for the IGEL Linux custom partition script engine. 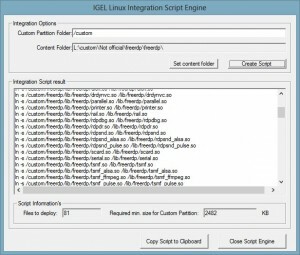 There are a lot of features not visible at the moment but if you deal with Linux scripting for the IGEL Linux custom partition feature it might be already a big help. i’ve written a small tool that i need for my own but maybe you can also use it…. It’s primary based on the idea that you can not figure out the Client IP, MAC-ID or Hostname in a connected XenDesktop/VDI in a Box session with user rights in a Login script in a simple way, also it can force a user logoff if the Client Hostname or IP do not fit compared with a given variable. The result will be displayed and also written into the registry to use it with other scripts, see also the readme for more informations. The download is available in the www.cloud-client.info download area, this tool is not directly related to IGEL but of course it can be used in a XenDesktop/VDI in a Box session running on an IGEL Thin Client. Important: It’s called XenDesktop Helper and not XenApp Helper->Do not use this tool with XenApp!! Use on your own risk, the publisher is not responsible for any damage or issue related to the use of this free release. This Management Pack provides the ability to monitor a IGEL Universal Management Suite Server including the HA feature running on Microsoft Windows based Servers. 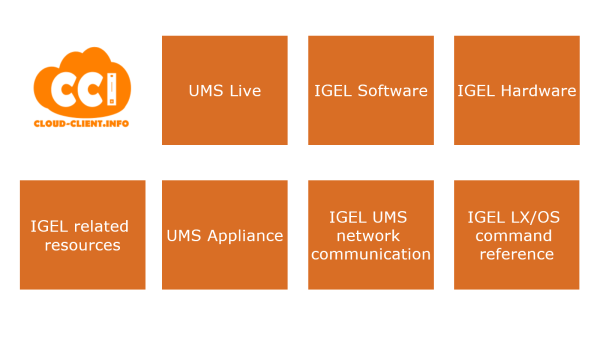 The management pack add’s a entry “IGEL Universal Management Suite for Windows” to the Operations Manager Monitoring tab, it provides the ability to monitor different events/task for the System and contains also a subfolder to monitor the IGEL UMS HA feature. You can also start/restart the related services from here. 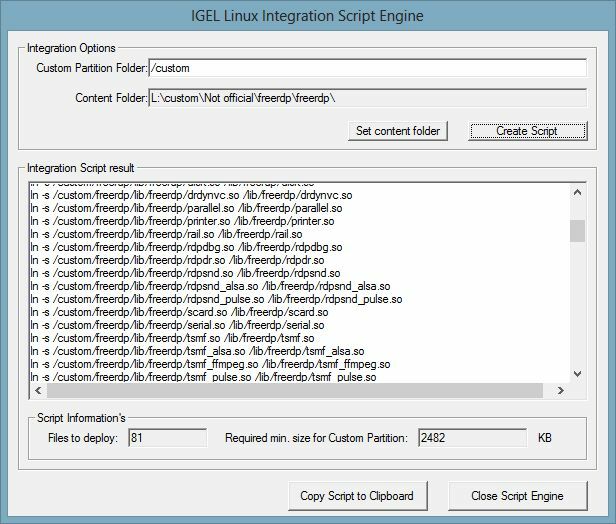 The management pack is preconfigured to detect the IGEL UMS Features without any interaction for all Systems in the Operations Manager console. i’ve uploaded a small tool which provides the ability to monitor an IGEL Universal Management Server thru the network. It do not only a small open port check, it creates real “simple” UMS traffic to check if the ports are open. I´ve uploaded a small update today, fist implementations for the custom partition feature support in lx are done. The upload is available via www.cloud-client.info/dati/dati.zip or if you are using DATI 1.00 you can use the update check feature to replace the files in your installation folder. since today you can download the DATI Tool for free via http://www.cloud-client.info/dati/dati.zip it includes also a Whitepaper which can be download here http://www.papershare.com/app/paper.aspx?id=1981&o=3736. 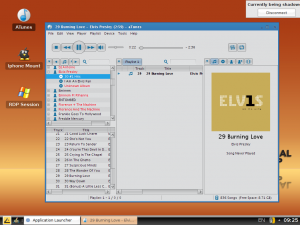 The tool provides an easy way to create partial Updates for Microsoft Windows based IGEL Thin Clients and can be very helpfull in larger client environments.